At first glance Sidewinder, a 5 reel, 243 ways to win video slot from Just For The Win and Microgaming, looks like a classic fruit machine. Dig a little deeper and you’ll see it comes with some innovative extras including a pair of horizontally spinning reels which can open up the ways to win to 576 or even 1,125. There’s also a free spins round with expanding wilds on the fully expanded reel set. Play on your PC, tablet or mobile from between 10p and £100 per spin. The design in Sidewinder is crisply done. You’ll see stars, playing card suits, bars, 4-leaf clovers, horse shoes and bells spinning around the reels alongside the lucky 7 which is the top payer. Land 3, 4 or 5 of those on adjoining reels and you’ll pocket an award equal to 2, 5 or 8 times your total bet. Central to the action in Sidewinder are the wilds. Joining the standard wild which can hit on all 5 reels are the Top and Bottom wilds which feature on reels 2 and 4 respectively. When they hit, they unlock 1 of the game’s pair of extras. Sidewinder feature – when the Top Wild appears on reel 2, it opens up the horizontal reel below the main set. The Bottom wild on reel 4 does the same for the top horizontal reel. With 1 of the horizontal reels open, you’ll have 576 ways to win. With both open, that increases to a whopping 1,125 ways to win. Free Spins feature – Sidewinder also comes with a traditional free spins round. Land 3 or 4 of the free spins scatter and you’ll receive 6 or 10 free spins. The free spins play out on the 1,125 ways to win machine with both the horizontal reels in play. Land a standard wild on the same position on both horizontal reels on the same free spin and they will expand and turn the whole of the adjoining vertical reel wild too. Hope to see plenty of free spins symbols too. Whenever 1 of these appears an extra free spin is added to your tally. It might look like a classic fruit machine but Sidewinder offers something a little different courtesy of the horizontal reels. 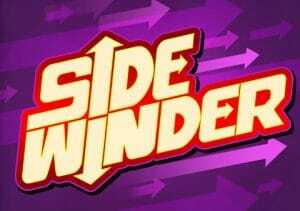 If you fancy a classic theme with an unusual twist or 2 then Sidewinder offers just that. You can win a cool 2,720 times your bet on each spin/free spin using 1,125 ways to win.